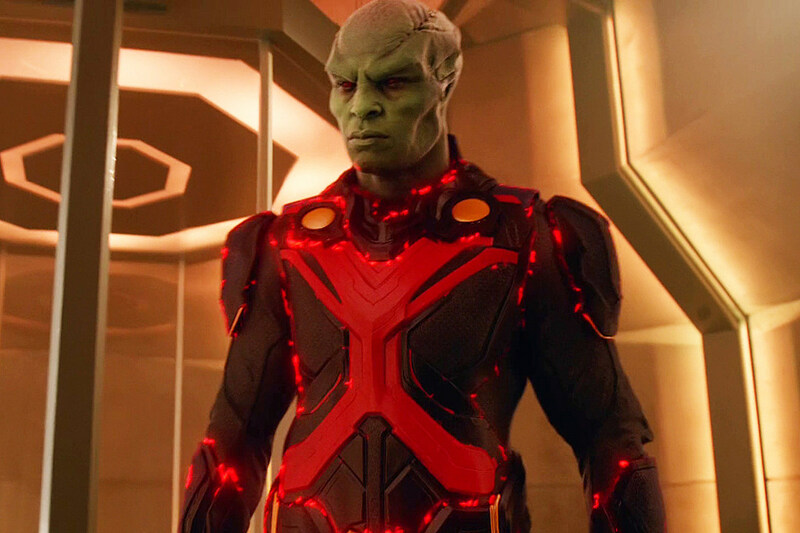 CBS’ Supergirl will take a well-deserved winter break after this past Monday’s cliffhanger-y “Hostile Takeover,” thought many a DC fan have been left reeling by the prior twist that a major series star had concealed their identity as J’onn J’onzz, best known as Justice League founder Martian Manhunter. Now, Supergirl bosses explain the unanticipated subversion, as well as its impact on Kara going forward. You’re warned of minor Supergirl spoilers from here on out, but prior episode “Human for a Day” took a surprising turn in the season-long tease that Hank Henshaw (David Harewood) had a reason for concealing his glowing red eyes, namely that said irises belonged to DC’s Martian Manhunter, rather than the Cyborg Superman of Henshaw’s comic namesake. We all started to think about and realized that if the Hank Henshaw we had created was an invention of J’onn to protect his true identity, it actually gave him an even more soulful back story than we had conceived. We were going to do some foreshadowing, but then we decided to let people think Hank is who he is, let them think he’s the antagonist. [On ‘The Flash,’] we had Harrison Wells, a really good guy who turned out to be the worst guy ever, so what if we had a seemingly antagonistic character on Supergirl who turned out to be not just a good guy but the warmest soul in the DC Universe? We also just thought the similarities between J’onn and Kara’s backstories made them a great pairing. In the comics, J’onn lost two daughters when Mars was destroyed, and we have created a show with two sisters who have lost their father…it just fits. Granted, Kara herself has yet to be made aware of the transition, while an upcoming Supergirl episode will see J’onzz’s Green Martian confronting the White Martians that annihilated his race. Was the Manhunter twist an effective one? Should showrunners have worked in such a drastic change to the pilot, or did a slow build work for the character?